What does a business model look like for the behavioral healthcare provider of the future? We can already guess some of the big challenges a future model might address, but how can we take action today to move closer to this ideal? Many industries have changed drastically over the last ten years as a result of technology, and our lifestyles have followed suit; think about the new ways we shop, the things we prioritize, and the customer experiences we have grown to expect. The next thirty to fifty years will reveal more periods of great change, but we can examine our progress now to predict some of the issues that future business models will address and the goals they will champion through the use of tech. 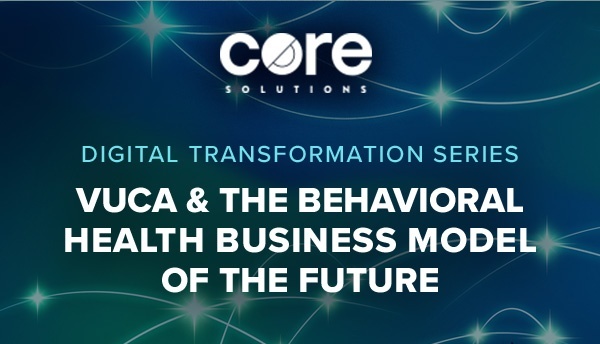 Three exciting fields have evolved in the last decade that reflect the changes coming to behavioral health and the skills business leaders must develop to give shape to the business model of the future. The integration of biology and technology has helped us execute a wide variety of tasks better, faster and cheaper, and this field in particular reveals a growing trend in both consumer needs and business model development. Biotechnology captures the interest of new consumers every year with its biggest venture, the human genome project. The millions of dollars scientists have spent decoding the human genome have translated to a DNA kit shipped straight to your door. Society is interested in genetics because we aim to be preventative and hands-on in our health and wellness. Observing our genes, acting to prevent diseases, forming good habits and working toward a healthier lifestyle is something that everyone wants. This shift will affect behavioral health in a big way, leading to improved preventative techniques and effective cures. It may seem like a fantasy, but some of the futuristic aims of nanotechnology are already a reality today, albeit on a very small scale. But as this field develops in the next few decades, we might see atoms and subatomic particles manipulated and assembled like software code to construct buildings in minutes instead of months and years. Consider the implications of this technology. It could be used to replicate food and goods that work to rid the Earth of famine and scarcity. It’s all a project in progress, but it highlights for us now the path that consumers want to take in the future—more instant gratification. We already use some level of artificial intelligence today that is based on statistical models. In looking at data of the past, we can predict what might happen in the future. Artificial intelligence has also worked its way into the space of machine learning—leveraging the power of machines to build technology that has the ability to think and act human. Already affecting us now, artificial intelligence is a dynamic field of study that may impact the technology leaders leverage to grow a more effective behavioral health business model. They may feel overwhelming now, but the big changes we can expect from technology are not something to shrink from when we can find better methods of change management. VUCA, a term from the military that we can adapt for our use in behavioral health, is a framework for smart decision-making that helps leaders consider the current market conditions and choose the best path for their business. It stands for Volatility, Uncertainty, Complexity and Ambiguity—concepts that come together to create a model for assessing challenges or disruptions and attempting to predict the results your actions will have on them. Each of the four concepts bring some context to the current and future state of behavioral health. While we might consider the behavioral health environment to be volatile, there are many rational decisions being made to address change in our industry. Life is always uncertain, but one thing we do know about behavioral health is that it fills a real need for consumers, evident in its growth over the years; we can be certain that BH services will still be needed in the future. Along with change comes complexity, but behavioral healthcare providers are learning how to handle it, as in the case of data-driven organizations finding ways to address the influx of data. Behavioral health is an immature, emerging industry that experiences a unique level of ambiguity. Using VUCA to address change affecting your business now may supplement your decision-making strategy, but there are other ways to prepare for future growth in behavioral health. Take steps to embrace digital transformation, invest in an EHR, make your services mobile, work on establishing an interdependent mindset and take seriously the trend toward value-based models. Behavioral health is your industry to shape, one step at a time—so get started today. Interested in learning more about the future of behavioral health? Request a demo of our EHR solution below to get to know our platform and how our team is working toward a better future for Behavioral Health.